Las Vegas is improving its public transportation by expanding the city's bus rapid transit services, which began with the MAX line in 2004. Photo by atruedrew. Bus rapid transit is successfully showing its virtues in Sin City. Last Thursday, Las Vegas broke ground on the ACE Green Line, a new BRT corridor that will connect downtown Las Vegas and Henderson, the second largest city in Nevada. The new buses, expected to begin operation late next year, will run on dedicated lanes along a 15-kilometer route of Boulder Highway, which is located to the east of the famous Las Vegas “Strip” and similarly dotted with several casinos and motels. Another line, the ACExpress W line, is also slated to launch later this year. The Green Line begins construction just weeks after the launch of the ACE’s first two BRT lines — the ACE Gold Line and the ACExpress C-Line — which have been heavily marketed to appeal to people who wouldn’t ordinarily get out of their cars to ride the bus because of long-held assumptions and stigmas about mass transit. One C-Line passenger, Chris Jacobs, a manager at Trump International Hotel, said, “This is the first time I’ve taken public transportation. Ever.” And he’s not alone. The Regional Transportation Commission (RTC) of Southern Nevada is spending $164.6 million of public money, some of it from the federal stimulus, to improve the way people move around Las Vegas. “This is our first truly commuter-type transit service,” says Tracy Bower, RTC’s director of media and government affairs, referring to the ACExpress C-Line, which connects Centennial Hills, a master-planned community in northwest Las Vegas, to the downtown area, and continues out to the University of Nevada, Las Vegas (UNLV). She emphasizes that a route to downtown that would typically take more than an hour can now be traveled in half the time. The new ACE lines have already exceeded ridership expectations, officials say. So far, about 20,000 people per day ride the ACE Gold Line, and 12,000 people have ridden the ACExpress C Line. This far exceeds the 4,000 to 6,000 riders originally predicted by the RTC’s computer models. Though local leaders like Rep. Dina Titus, from the House Transportation and Infrastructure Committee, and RTC Commissioner Chris Giunchigliani both praise the benefits of Las Vegas’ new BRT system — like job creation and shorter travel times — they also seem to have an inherent preference for light rail. “I’d like to see light rail, but in the meantime, this is great,” Titus says. But perhaps they’re not giving the buses enough credit. This perceived comfort and convenience isn’t all an illusion, though. Other features of the new buses, common to standard BRT systems elsewhere in the world, include prepaid ticketing from vending machines at transit stations (through a system known as Ticket Now), limited stop service, dedicated bus-only lanes, and level-platform boarding. 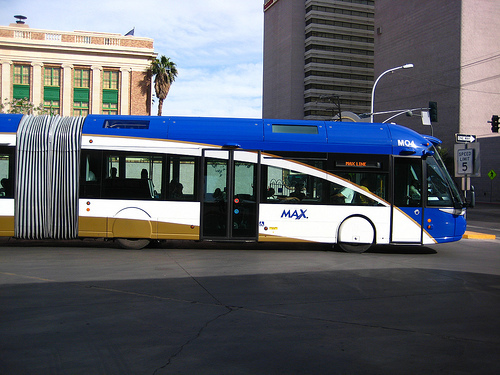 The new ACE services have boosted ridership on the city’s existing bus services, including the 24-hour, double-decker bus line, known as The Deuce, which stops at nearly every casino and hotel along The Strip, and the Metropolitan Area Express (or MAX), the city’s very first BRT line, which has been running on Las Vegas Boulevard North since 2004. Studies have shown that when the MAX began using the larger buses on dedicated lanes, ridership increased by 35 to 40 percent. The new lines may also encourage dense development, which is a good thing for an urban desert known for its sprawl. The city of Henderson — now connected to Vegas by the ACE Green Line — recently created a Boulder Highway Investment Strategy that calls for high-density, mixed-use development integrated with multi-modal transportation.